Product prices and availability are accurate as of 2019-04-20 09:57:11 UTC and are subject to change. Any price and availability information displayed on http://www.amazon.co.uk/ at the time of purchase will apply to the purchase of this product. 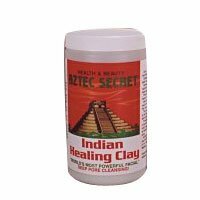 Beautyland is pleased to offer Aztec Secret Indian Healing Clay. This Aztec Secret Indian Healing Clay is 100% Natural, contains No additives. No fragrances, has not been tested on animals, and has No Animal Products - it is 100% natural. Clays have been used for centuries as a facial masks to enhance and revitalize the skin. It is said that Cleopatra used clay from the Nile River and the Arabian Desert as part of her beauty ritual over 1,800 years earlier. German and Roman day spas built over some 4,500 years in the past used clay packs and treatments. Today, chic, fashionable spas the world over utilitse clay packs and masks in their beauty treatments. Aztec Secret Indian Healing Clay is 100% Natural.